Moringa is used for anemia, arthritis and other joint pain (rheumatism); asthma; stomach and intestinal ulcers; intestinal spasms; headache; heart problems; high blood pressure; kidney stones; fluid retention and bacterial, fungal, viral, and parasitic infections. Moringa is also used to reduce swelling, boost the immune system. Some people use it as a nutritional supplement or tonic. 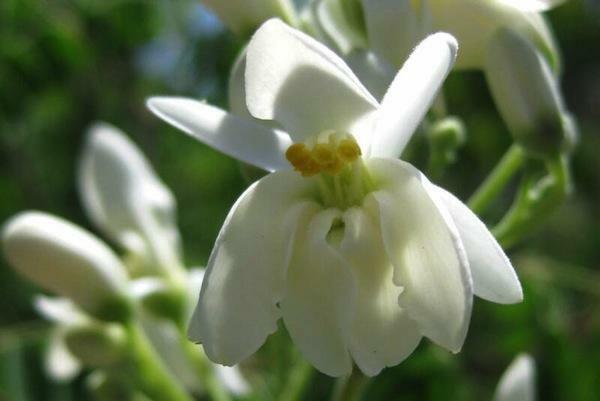 Oil from moringa seeds is used in foods, perfume, and hair care products. Moringa is an important food source in some parts of the world. Because it can be grown cheaply and easily, and the leaves retain lots of vitamins and minerals when dried. The immature green pods (drumsticks) are prepared similarly to green beans, while the seeds are removed from more mature pods and cooked like peas or roasted like nuts. The leaves are cooked and used like spinach, and they are also dried and powdered for use as a condiment.